Forget the glass ceiling. The big threat to women's success in top roles is now the 'glass cliff' - being promoted into risky, difficult jobs where the chances of failure are higher. Women are "smashing through the glass ceiling" of the country's top businesses, a report in the Times last November said. 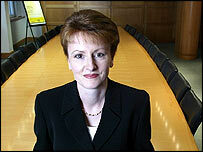 Numbers of female directors on the boards of FTSE 100 companies had risen by 20% in the previous 12 months, it said. But the article posed a thorny question: "Women on board: A help or a hindrance?" and went on to conclude, in no uncertain terms, that women are a hindrance. Shares in companies with more women directors tended to underperform relative to the FTSE average, the paper said. And companies without women on their boards tended to outperform the average. One commentator concluded that "the triumphant march of women into the country's boardrooms has wreaked havoc on companies' performance and share prices". 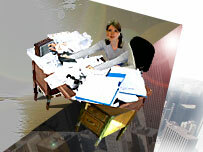 This conveys a pessimistic message about the contributions of women in the modern workplace. Certainly, if it's true that poor company performance can be directly attributed to women being given top jobs, it would seem to undermine the case of those who lobby for women to be given leadership roles on grounds that their diverse strengths can benefit the companies that employ them. However, our research, to be published in the British Journal of Management, indicates that such pessimism may be premature and unfounded and that rather than women leaders causing poor company performance, poor company performance may lead to the appointment of women to positions of leadership. We conducted an extensive study of the performance of FTSE 100 companies, before and after the appointment of a male or female board member. This analysis revealed a much more complex story than that suggested in the Times. The appointment of a woman director was not associated with a subsequent drop in company performance. Indeed, in a time of a general financial downturn, companies that appointed a woman actually experienced a marked increase in share price after the appointment. But more interesting were the fluctuations in company performance leading up to the appointment of women to boards of directors. In a time of a general financial downturn, companies that appointed a woman to their board had experienced consistently poorer performance in the five months preceding the appointment than those who appointed only men. It therefore appears that after having broken through a glass ceiling women are actually more likely than men to find themselves on a "glass cliff", meaning their positions of leadership are risky or precarious. A glass cliff is a dangerous place to be. Companies that have experienced consistently bad performance tend to attract attention, both to themselves and their boards. In such circumstances, negative outcomes are more likely, and if they occur - as the Times article shows - they are likely to be blamed on the abilities of the leaders involved rather than other factors that may affect the company. Women who take on leadership roles may be more exposed to criticism than men in the same position. They may also be in greater danger of being held responsible for negative outcomes that were set in train well before they assumed their new roles. Consider events at WH Smith. In the year since Kate Swann was appointed CEO of the embattled High Street shop and given the task of improving things, both Swann and WH Smith have featured prominently in the media, accompanied by reports of poor company performance and criticism of high remuneration packages. But glass cliffs are not only found in the City. They are also in politics - where women are asked to run in less winnable seats or given more risky cabinet positions - and in the law, where women are assigned to more risky legal cases than are men. Mrs Thatcher, for example, met a series of glass cliffs. Her first brush with politics was to run as a Conservative candidate twice in a strong, safe Labour seat, losing at both attempts. She was made education minister in the early 1970s when student radicalism was at its peak, facing student riots and strong criticism. 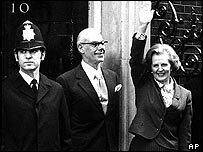 Finally, in 1979 she became prime minister at a time when Britain was facing rampant unemployment and economic recession. There's also evidence of the glass cliff in Australian politics. In particular it is notable that there have only ever been two women state premiers - Joan Kirner in Victoria and Carmen Lawrence in Western Australia. Both were appointed mid-term and after their party had been exposed to humiliating scandals. As a result, both faced the prospect of unwinnable elections which they duly lost. We are continuing our research by studying the social and psychological processes that contribute to glass cliffs and the long-term implications of placing women in precarious leadership positions. We are also working with the Chartered Institute of Personnel and Development to raise awareness of the circumstances under which these appointments are likely to occur, and to find ways of ensuring that strategies for increasing workplace diversity are implemented and evaluated fairly. If you have experience of glass cliffs or wish to participate in Ryan and Haslam's research, click on 'Internet links'. Michelle Ryan is a research fellow in the School of Psychology at the University of Exeter. Alex Haslam is a professor of psychology at University of Exeter and editor of the European Journal of Social Psychology. Their research is funded by the Leverhulme Trust.